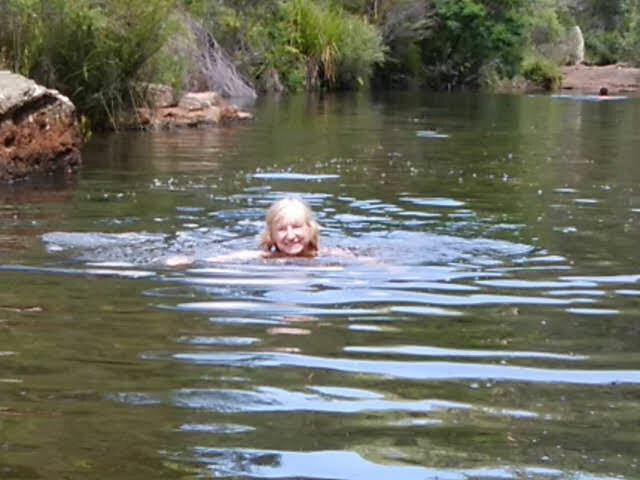 Waterfall is a good place to commence a walk in the Royal National Park as the walk can be lengthened or shortened as the weather and other circumstances demand and the walk can end at one of several railway stations. 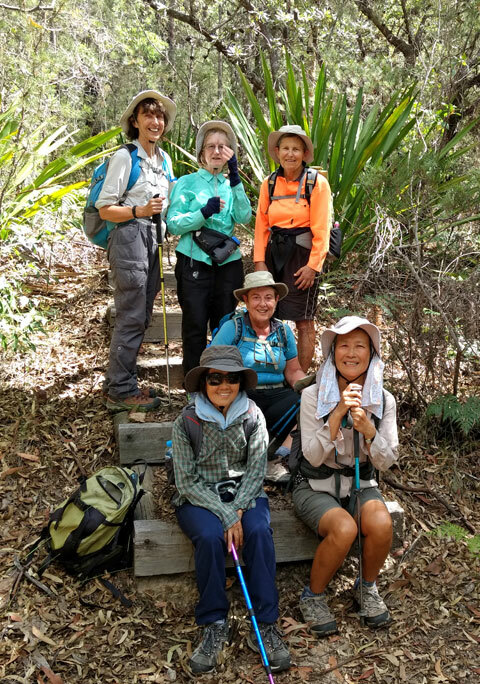 On 14 February 2019 I greeted nine fellow walkers at Waterfall railway station and we were all pleased to have a cooler day than usual for our walk to Heathcote. However, only seven of us completed the walk, as 4.5 kilometres later one person fell and broke her wrist badly and two people [David and Lucy] stayed with her until the 4WD ambulance arrived. After a much longer morning tea than unusual, whilst first aid was applied and the rescue organised, we headed for Uloola Falls, which were not falling as a result of a very dry summer. We did not delay there as I usually do, but headed up Gurumboola Ridge from where there are views of the city, which no-one wants to see on a bushwalk. As the day began to warm up we stopped frequently for drinks of water. Few flowers braved the heat but fringed lilies and lesser flannel flowers were scattered in the undergrowth. We had lunch at a high point on a large rock at Robertson Knoll with views of the Hacking River and the Audley Weir. 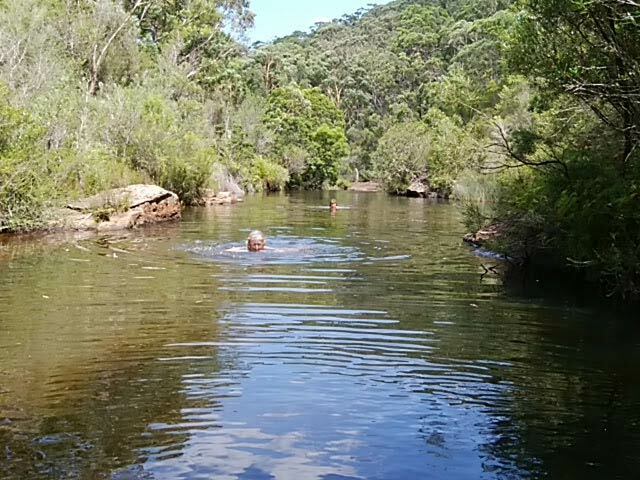 Next we descended to the head of navigation on Kangaroo Creek where two of us had a swim in one of the larger pools. 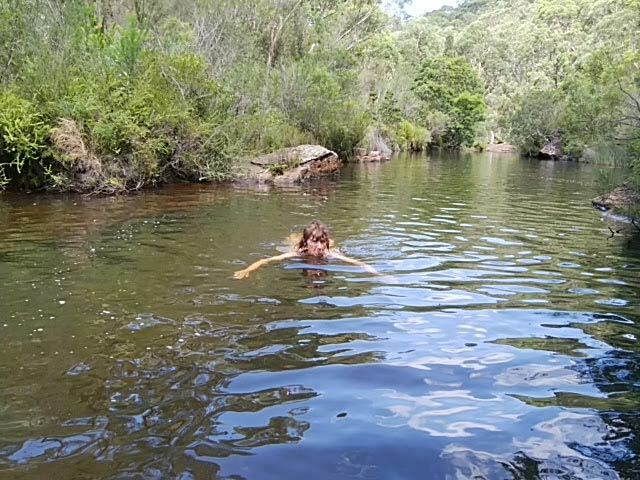 The water did not look pretty due to its low level but it was beautifully cool and I am sure that it helped with the climb up the steep Engadine Track. Almost at the top of the climb our prospective on the walk took a photo of six of us with a glorious green backdrop of Gymea Lilies. At the top we had a water stop whilst we decided which misleading sign to follow back to Heathcote. I chose the unmarked track I usually follow and for the first time turned on Google Maps, which confirmed that it was the most direct route to the railway station. Some walkers had never been in the area before but everyone reported that they had enjoyed their day in the Park. We have since heard that our fallen comrade had successful surgery and the incident has not put her off future romps in the Royal.